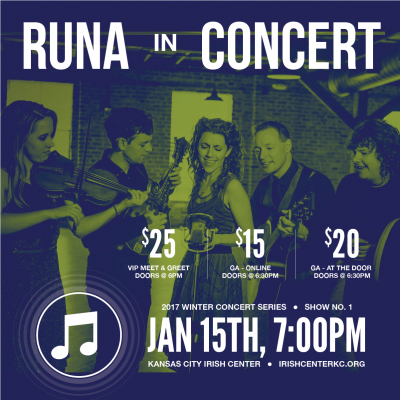 The Kansas City Irish Center is excited to welcome RUNA back to Kansas City for a one-night concert event. Quickly gaining recognition as one of Irish music’s new “super-groups,” RUNA has been enchanting audiences by pushing the boundaries of Irish folk music into the Americana and roots music formats since their formation in 2008. Interweaving the haunting melodies and exuberant tunes of Ireland and Scotland with the lush harmonies and intoxicating rhythms of jazz, bluegrass, flamenco and blues, they offer a thrilling and redefining take on traditional music. The group has been honored internationally, winning Top Group and Top Traditional Group in the Irish Music Awards and three Independent Music Awards including Best World/Traditional Song and Best Bluegrass Song. Their strive for excellence and creativity blazes a trail for the future of olk music, earning them the reputation as one of the most innovative Irish folk groups of this generation. TICKETS: $25 – Meet & Greet, $15 – General Admission. NOTE: GA ticket price will be $20 at the door; VIP tickets only available pre-sale. Seeking to preserve and continue a traditional culture in a modern age, RUNA creates the backbone of its signature roots sound from the musical and geographical diversity of its individually established band members. Their strive for excellence and creativity blazes a trail for the future of folk music, earning them the reputation as one of the most innovative Irish folk groups of this generation. Band website.